January’s Boxer Business Briefs presented by ODDS Marketing gave tenants an education on the basics of digital marketing and then stepped up the game with tips on how to get a targeted campaign set up using Programmatic Marketing. Attendees found out that Programmatic is a game-changer for small and medium sized businesses who think they can’t compete with the big guys. Each month Boxer Property hosts the Boxer Business Briefs to all of their Houston customers. The goal is to provide a little more than your standard “four walls and a door” that you get with most office buildings. We provide a lunch & learn seminar on topics that will help small and medium sized businesses grow their business! “When you grow, we grow!” says Marc Vecchio, Director of Operations at Boxer. We want to continue fostering growth and community with these educational segments on various strategies to help your business grow and stay on track. Each month focuses on a different topic in areas from Leadership, Marketing, Taxes & Accounting, Customer Service and more! ODDS did a brief review of some standard digital marketing strategies that they have expertise in. They touched on their top focus which included Web design, development, content development, SEO (which is super broad and has several areas of focus), video production, digital advertising, email marketing. Some small business aren’t aware that there are a lot of FREE things that can be done to help improve visibility and position them better online with their target audience. Those areas include setting up a Google My Business Page, Creating a website (yes, there are lots of free tools to make a website including WordPress), create a Facebook Page, get active in social media and produce relevant content for your business. Since you’re the expert in your business’ arena, you can help drive traffic to your business by writing informative articles or looking on Google for keywords associated to your business and writing articles including those keywords. So, once you have gotten the basics down and you have a budget to spend on advertising, now is a great time to look into targeted advertising. You don’t want to blow your money on the “shot gun” strategy just putting your ads out there and hoping the right people will find you. You want to get to know your target audience and get in front of them at just the right time! That’s where Programmatic Marketing comes in. ODDS Marketing is an expert on this strategy and can advise businesses on the best plan for their business. It varies for each business, so customizing a programmatic campaign with their expert advice is the best way to go! We hosted approximately 25 small businesses to free lunch this month and they definitely walked away with a good education and some free stuff including an SEO audit, and a few lucky winners also were given the opportunity to have a full Marketing Audit completed for their business. 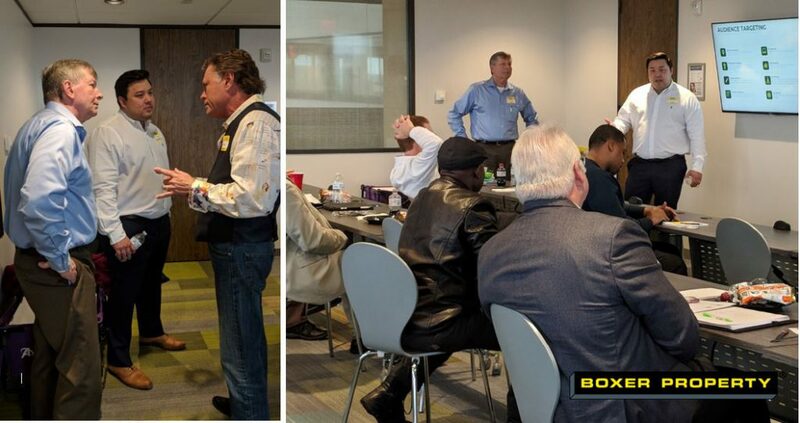 Stay tuned for February’s Boxer Business Brief event, which is normally held at Arena Towers, Boxer Workstyle suites on the 14th floor at 7324 Southwest Freeway in Houston.